Design your own insulated medicine case from sizing and hardware to fabrics and fonts and everything in between! Pictures shown are examples. 100s of fabrics and other design options to choose from. To preview the design forms, please visit: http://bit.do/alertwearforms. This case comes in three sizes to fit a wide variety of medicines. The largest case shown is 9" x 5 1/2", then 8 1/4" x 4 1/2" and finally the smallest case shown is 7 1/2" x 3 1/2". 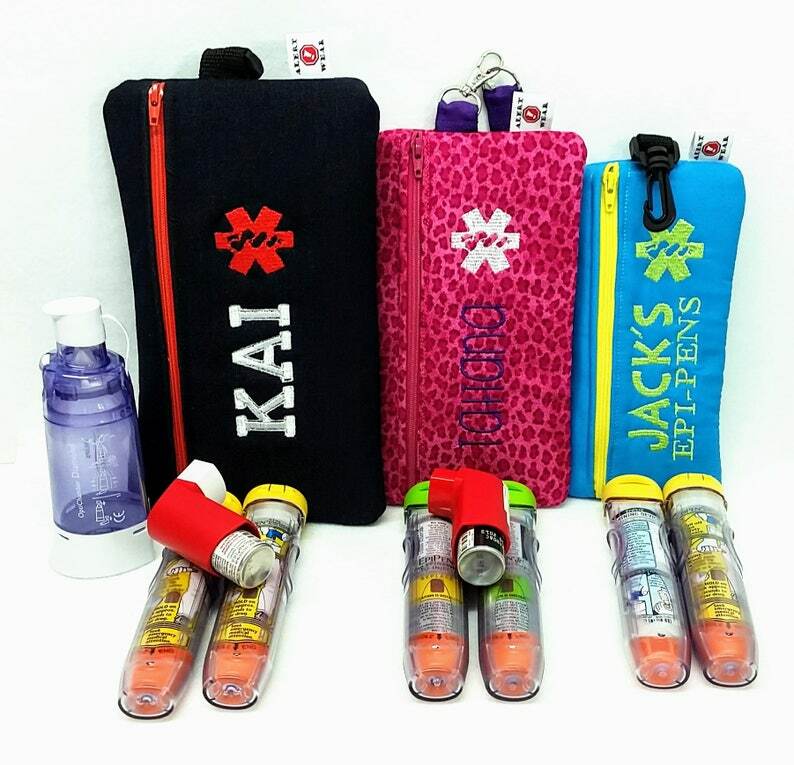 The smallest case will easily hold 2 AuviQ with a standard sized inhaler as well. This case works great for other medicine as well. Please message me if you would like help determining what size will work best for you. We use a variety of layers of materials to help protect and insulate your medicine. Every case will have a minimum of four layers of materials, including the insulation. The insulation that we use reflects the extreme temperatures away from the medicine. It is breathable yet, won't break down with repeated washings. The insulation, insulates. It is heat-RESISTANT, NOT heat-proof. It is the same material that is used in hot pads and lunch bags usually. When we tested it in extreme temperatures with both AuviQs and Epi-Pens in two cases (one with insulation and one without), the medicine was slower to get to high heat temps and freezing temps but, eventually extreme temps were reached. The medicines were cooked at 170 degrees in the oven, left in the hot sun all day and then frozen for three days. None of the medicines became cloudy or discolored (insulated or not). This listing includes the ICE Panel = In Case of Emergency Embroidered Panel. Also included are your choice of D-Ring, Swivel Clip or Wristlet. Belt = A D-Ring will be added to each side of the case so that the durable, adjustable, webbing belt can be attached. 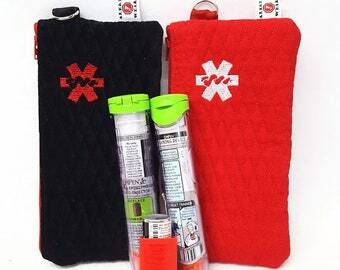 Alert Wear Insulated Medicine cases are exclusive copyrighted patterns of Alert Wear. All photos, descriptions and patterns are Copyright 2006-2019. All rights reserved.